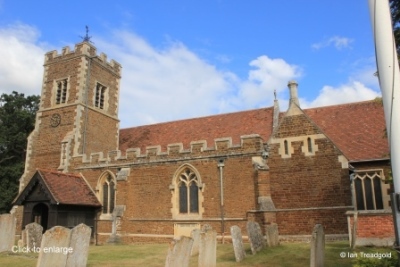 The church of All Saints, Campton is situated on the north side of the main crossroads through the village. Campton lies to the south of the A507 Ampthill to Shefford road. Reference: All Saints Church, Campton - Visitor's Guide - leaflet available from the church. 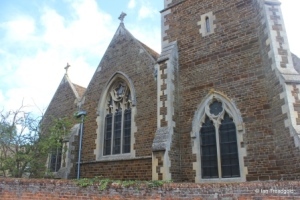 All Saints has a nave, chancel, north and south aisles with a chapel to the north of the chancel. On the south side is an organ chamber dating from 1898. 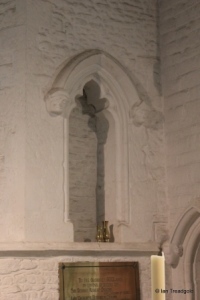 The tower is in the south-west corner of the south aisle. Presumably this slightly unusual location for the tower was brought about by the constraints of the churchyard site and the proximity of the original road out of Campton to the north-west known now as Rectory Road. The chancel is around 25 feet by 16 feet, the nave 50 feet by 18 with the north aisle adding 12 feet and the south around 10. The tower is around 10 feet square and 43 feet high. 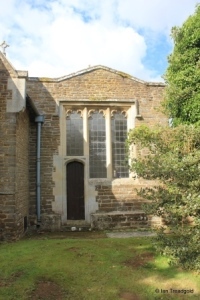 The original chancel was enlarged in about 1320 by building a new south wall in line with the south arcade of the nave thus causing the enlarged chancel to be slightly off-centre when compared with the nave. 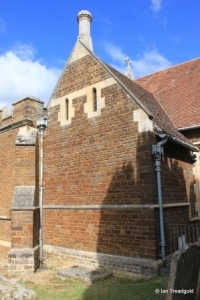 The tower was added in C15 replacing one of the bays of the south aisle. 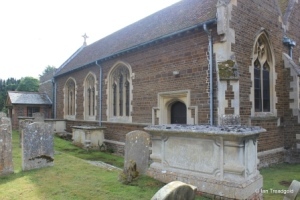 The south aisle has an embattled parapet. 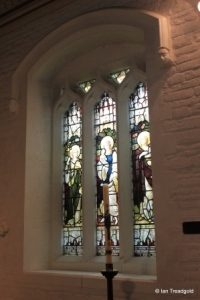 The windows in the south aisle are all modern although they may have been copied from the C14 predecessors. 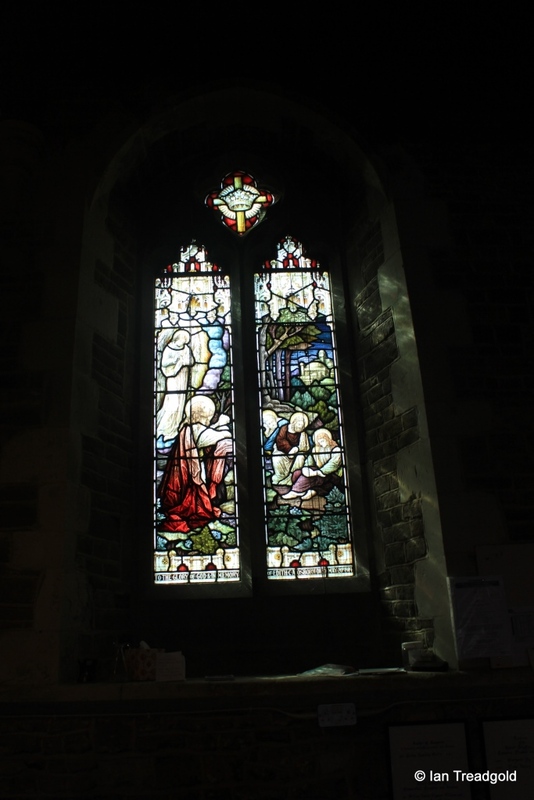 The eastern most window is of three trefoiled lights under a square head with the glass depicting Faith, Hope and Charity. 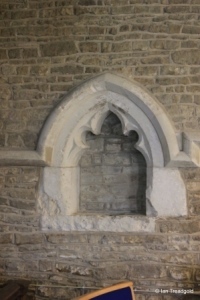 The organ chamber has two high single lancet windows along with a chimney implying the organ chamber was also used as a vestry of sorts. 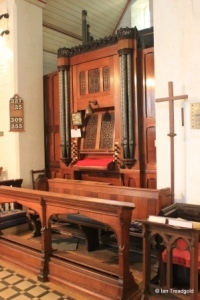 The chamber dates from 1898 and contains an organ that may have originated at Chicksands Priory. 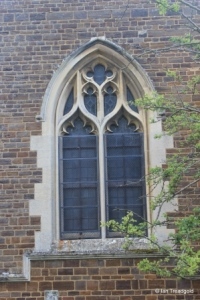 The other two windows in the south aisle are both of two trefoiled lights under pointed arches, the eastern having flowing tracery whilst the western has more simple tracery. 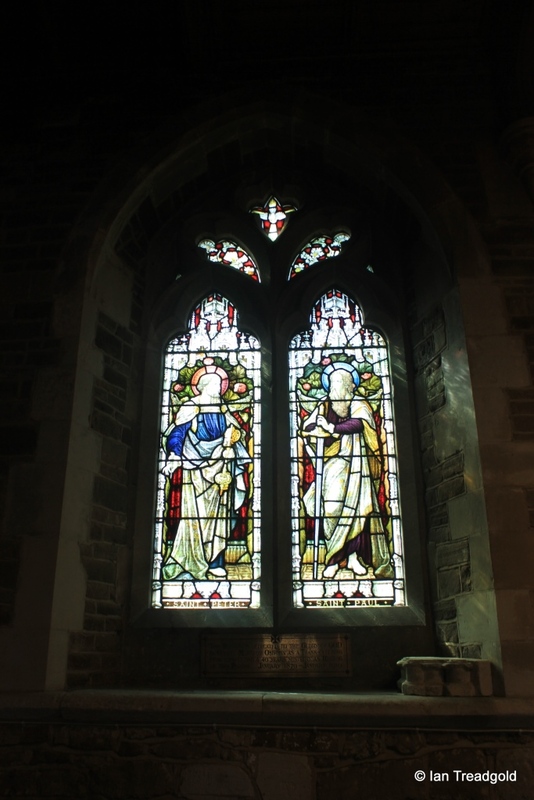 The eastern window, shown to the right was dedicated to the memory of Edith Osborn who died on May 20th 1914. 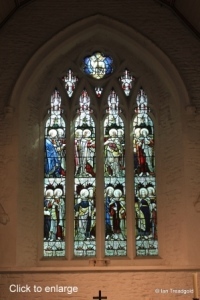 The western window close against the porch depicts St Peter and St Paul. 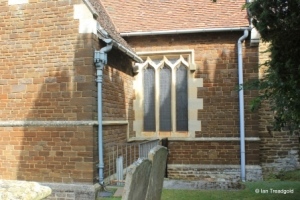 The south porch is wooden and from its alignment, partially obscuring the western south aisle window, is of later construction than the aisle. 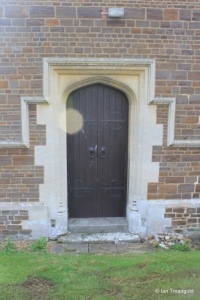 To the east or right of the door in the porch is a holy-water stone. 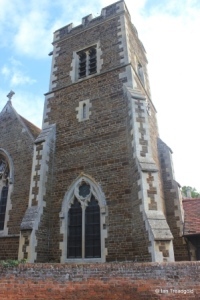 The embattled south-west tower has three stages with entry from inside the church. The south face holds the clock. 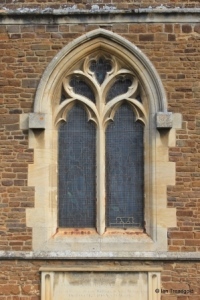 The west face has a two-light cinquefoiled with sexfoil tracery under a pointed arch. The middle level has just a small lancet on the west side with all four sides having two-light cinquefoiled belfry windows under square heads. There is an intricate weather-vane on the roof. 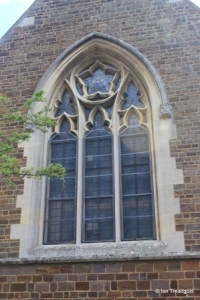 The west window is of three-lights with modern tracery incorporating both trefoiled and cinquefoil lights under a pointed arch containing a tudor rose in a circle in the head. 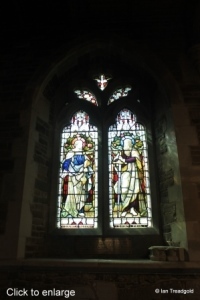 The north aisle has a window at the west end and three windows to the north. 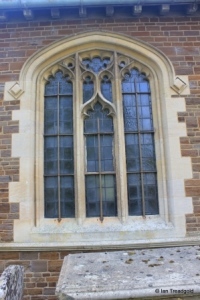 The west window is of two cinquefoiled lights under a pointed arch with modern tracery in the head. 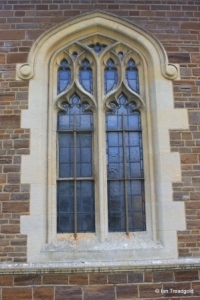 The three windows on the north aisle are all of modern design with the outer pair being of three-lights and the middle, two-lights. 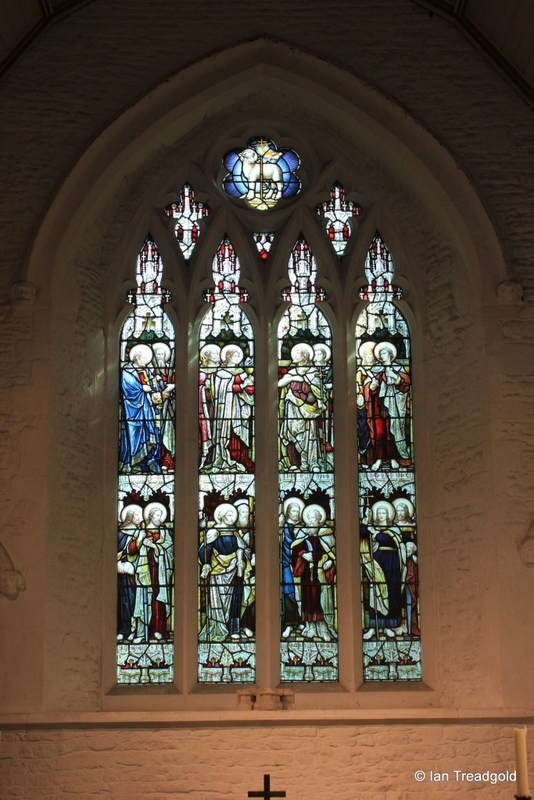 All are cinquefoiled lights with the tracery of the middle light reflecting that in the centre window. 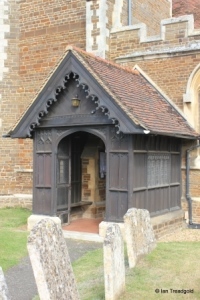 The north chapel dates from 1649 and is known as the Osborn chapel and contains monuments and remains of the Osborn family from Chicksands. 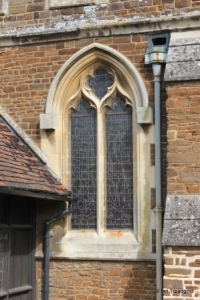 The east window of the chapel has three lights built around the doorway. 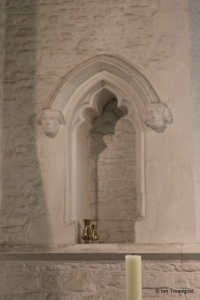 These lights are of cinquefoil tracery with rounded under a square arch. 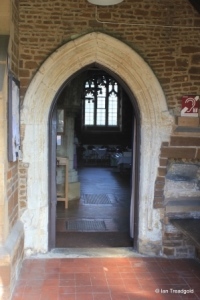 The door itself is under a four-centred arch below a transom in the southern light. 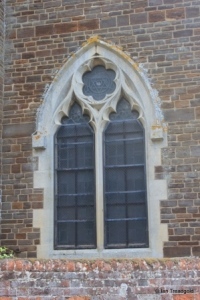 The east window is of four pointed cinquefoiled lights under a two-centred arch sexfoil tracery in a circle in the head. 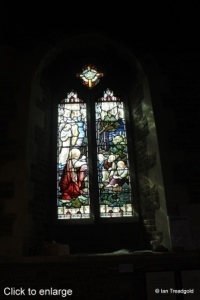 The glass depicts the Lamb of God and sixteen images of saints. 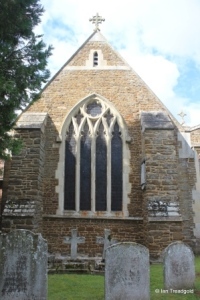 There are gable crosses on the east end of the chancel and nave as well as on the west ends of the nave and north aisle. 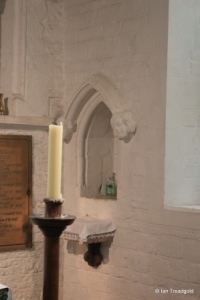 In the chancel there is a piscina to the south of the altar and two empty statue niches in the east wall. 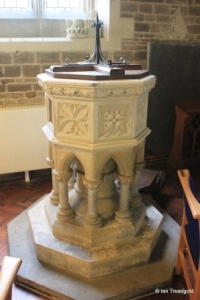 The octagonal font is modern in church architecture terms. Towards the east end of the south aisle is a C14 piscina. Page last changed 04/09/2014. Reformatted 09/12/2015.